The Eastwood 24" Slip Roll is a professional metal fabricators tool which is indispensable for producing accurate bends, cylinders and conical shapes for virtually all metal working projects. In addition, the Upper and Rear Rollers feature grooves in 3 popular sizes for forming curves in Wire and Tubing. The gear-driven, design delivers maximum forming power with minimal handle force. 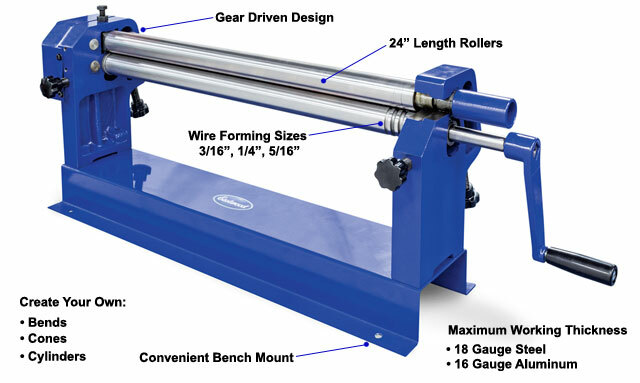 The Eastwood 24 inch slip roll is designed for use on sheet metal and wire up to 24 inches in width of 18 gauge Steel or 16 gauge Aluminum in thickness. This unit will create gentle arcs, cones or cylinders, helping you create patch panels for rockers, roll pans, door skins and lower fender areas. Maximum roll width is 24 inches and minimum cylinder or roll diameter is 1.5 inch. This unit will also roll wire in 1/8 inch, 3/16 inch, 1/4 inch and 5/16 inch diameters. Always wear eye, face and hand protection when handling sheet metal.